The subway cars of the future might be built without internal doors, allowing passengers to roam freely and safely throughout the train. The New York Times reports that the MTA’s twenty-year plan includes a possible switch to articulated trains (think accordion-style buses). 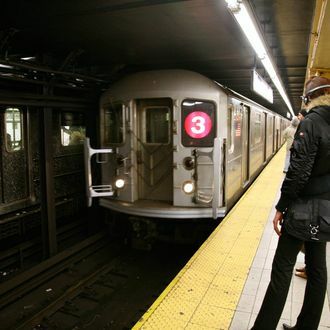 According to the MTA, the change would “maximize carrying capacity” and “[balance] loading and unloading times at all doors,” decreasing the amount of time trains spend idling at stations waiting for people to force their way in and out of overcrowded cars. But Brad Ross, a spokesman for Toronto’s subway system, which uses articulated trains, warns that there are some downfalls: “Young children have been disappointed that the conductor cab occupies the entire width of a car, precluding the pastime of peering into the tunnel from a front window.” And when older children puke, it gets everywhere. Or, as the Times put it, “There is the scourge of the sick passenger, most ominously on weekends or holidays like New Year’s Eve, Mr. Ross said, when evidence of overindulgence can occasionally find its way onto a car’s floor. ‘In the past we’d be able to isolate that particular car and clean it,’ [Ross] said. ‘Now that you’ve got an open gangway, you can’t necessarily.’” Otherwise, the new trains have “proved largely successful,” Ross said. Andrew Albert of the MTA pointed out that “everybody loved the locked end doors” back when New York was “in the high-crime era and gangs were roaming through the trains.” But now that those days are over, it doesn’t seem like there’s any good reason to not allow passengers the opportunity to expand their search for an empty seat, or at least a place where they can’t hear some guy clipping his nails.